Sometimes you write a column just so you can forever after refer people to it. “Oh, that subject/point/complaint/theory/argument? I tackled/countered/responded to/exploded/demolished that back in July ’11—here’s the link.” Well, this is one of those. Back in—heaven help me!—1999 I wrote a column for the Weekly Standard about Uighurs. That’s “WEE-goors,” an ethny of ten million or so (depending on whose statisticians you want to believe) scattered across Central Asia and speaking a language akin to Turkish. They follow Islam, though mostly in the laid-back Turkish style rather than the more intense Arabian and Iranian modes. There’s a considerable diaspora, with several thousand in the USA, most around Washington, DC. Uighurs explain and promote themselves on a mass of websites: There’s a good collection here. 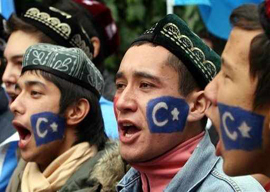 Most Uighurs are citizens of the Chinese People’s Republic. Their region had been taken over by China in those historical periods when the Chinese stopped fighting each other for long enough to impose imperial control over their “near abroad.” The last such takeover occurred in 1949 when Mao Tse-tung’s army marched into the Uighurs’ home region. The Chinese communists subsequently visited all of Maoism’s cruelties and blunders on the unfortunate Uighurs, as they also did on their own longsuffering people and the other non-Chinese ethnies of their near abroad, most famously the Tibetans. Naturally the Uighurs resented being ruled by foreigners, especially by foreigners practicing Maoist China’s demented politics. There was a resistance movement, occasionally flaring up into isolated guerilla skirmishes or terrorist acts. This was happening in the late 1990s, and that was the occasion of my Weekly Standard column. I had encountered expatriate Uighurs when hanging out with the Tibet Society in London during the early 1980s. I’d heard their story and exchanged letters with Erkin Alptekin, the nearest thing to a Uighur voice in the West at that time. So there, in 1999, was this column of mine in the Weekly Standard, taking the Uighurs’ side against the Chinese. The Chinese government maintains a large corps of hired Internet trolls whose job is to counter anything anyone posts that is contrary to Chinese state dogma. (You can see their work in, for example, the reader reviews of Frank Dikötter’s recent book about Mao’s famines.) Beyond these paid shills there is a big penumbra of fiercely nationalist Chinese, unpaid trolls who make no distinction between Communist Party policy and the national essence. All right, here’s what I say. Muslim terrorism. Most Uighurs are Muslims and a few are terrorists. There has been a handful of Uighurs among the Muslim terrorists plaguing the West this past decade or so. To the degree that Muslim terrorism is a problem for Western nations, though, it is because of those nations’ damn fool policies—mainly, the policy of allowing Muslim settlement. There was never any reason why Britain, France, or the USA should permit large-scale Muslim settlement. There are 57 nations in the Organization of Islamic Cooperation. Any Muslim who is dissatisfied with his nation of domicile is spoiled for choice. He can emigrate to any of 56 other Muslim nations, most possessed of very agreeable climates, and some stinking rich.